CLICK IMAGE for Assassination Information!! Less powerful and rivals of the Medici, the Pazzi were caught up in a conspiracy to replace the Medici as rulers of Florence. Giuliano de' Medici was stabbed 19 times by Bernardo Bandi and Francesco de' Pazzi. As he bled to death on the cathedral floor, his brother Lorenzo escaped with serious, but non life-threatening wounds. Lorenzo was locked safely in the sacristy by Angelo Poliziano. Francesco de' Pazzi put together a plan to assassinate Lorenzo and Giuliano de' Medici. conspirators were soon caught and summarily executed; five, including Francesco de' Pazzi and Salviati, were hanged from the windows of the Palazzo della Signoria. Jacopo de' Pazzi, head of the family, escaped from Florence but was caught and brought back. He was tortured, then hanged from the Palazzo della Signoria next to the decomposing corpse of Salviati. The Pazzi were banished from Florence, and their lands and property confiscated. Their name and their coat of arms were perpetually suppressed. The name was erased from public registers, and all buildings and streets carrying it were renamed. Their shield with its dolphins was everywhere obliterated. Anyone named Pazzi had to take a new name; anyone married to a Pazzi was barred from public office. The plan was widely known: the Pope was reported to have said, "I support it — as long as no one is killed." In 2004, an encrypted letter in the archives of the Ubaldini family was discovered by Marcello Simonetta, a historian then teaching at Wesleyan University in Connecticut, and decoded. It revealed that Federico da Montefeltro, Duke of Urbino, a renowned humanist and condottiere for the Papacy, was deeply embroiled in the conspiracy and had committed himself to position 600 troops outside Florence, waiting for the moment. DID THE DUKE OF URBINO DO IT?? On April 26, 1478, Lorenzo de' Medici (who escaped) and his brother Giuliano (who died) were repeatedly attacked with knives by a gang of men who invaded the Duomo cathedral in Florence during a high Mass. It was part of a plot against the powerful Medici family, de facto rulers in the Florentine republic for hundreds of years. Now a Wesleyan University scholar says he has cracked the 500-year-old case with the help of a recently discovered coded letter. For hundreds of years historians have known the plot was largely engineered by Francesco de Pazzi, from a rival family of bankers, with an assist from Pope Sixtus IV, who sought power for his nephew. But by deciphering an encrypted letter that he discovered in a private archive in Urbino, Marcello Simonetta, a professor of Italian history and literature, shows that the mercenary Federico da Montefeltro, duke of Urbino, orchestrated the coup. Notably the duke has gone down through history as a humanist, without any connection to the conspiracy. Mr. Simonetta's findings have been published in The Archivo Storico Italiano, the oldest Italian historical journal, and in his new book, ''The Secret Renaissance: The World of the Secretary From Petrarch to Machiavelli'' (Franco Angeli, 2004). ''It's very, very exciting,'' Mr. Simonetta said of his successful efforts to crack the code of the three-page letter, sent by the duke to his ambassadors in Rome two months before the coup attempt. The letter, Mr. Simonetta said, unveils the duke's personal insistence on getting rid of the Medici brothers, discusses his military contribution to the plot (550 soldiers and 50 knights) and expresses gratitude for the pope's gift to the duke's son Guidubaldo, a golden chain that represented legitimization of the Montefeltro dynasty under papal jurisdiction. Mr. Simonetta's discovery is highly significant to Renaissance scholars, said Melissa M. Bullard, a professor of history at the University of North Carolina at Chapel Hill. Mercenary captains like Montefeltro, she said, always posed a threat to the state or ruler who hired them, at at time of constant jockeying for position among Italian city-states. ''Had the Pazzi taken over, the course of Florentine history and the course of northern Italy would have been altered,'' said Ronald Witt, a professor of history at Duke University. ''There probably would have been much greater instability. The fact that the Medici stayed meant there was continuity in the leadership. ''One of history’s famous unsolved whodunits is the Pazzi conspiracy, in which an attempt to overthrow the Medici family, rulers of Florence, led to a brutal and brazen murder. For 500 years rumors have circulated about who masterminded the conspiracy. Now Marcello Simonetta, assistant professor of Romance languages and literatures, has cracked the case with the help of an ancient family heirloom. The evidence he unearthed points to the top of Florentine society and straight to the heart of the Vatican. The key to the case was a code-breaking manual passed down through generations of the Simonetta family from their ancestor, Cicco Simonetta. Coded correspondence was common during the Italian Renaissance because writers had no assurance that confidential material would not be intercepted and read in transit. The conspiracy involved two feuding families?the Pazzis and Medicis. The Medicis had been rulers of Florence for about 45 years at the time the letter was written. Federico da Montefeltro, the popular Duke of Urbino, was the author of the secret letter. 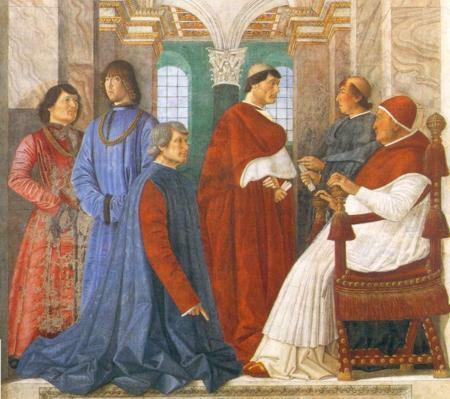 Its contents reveal that he conspired to overthrow the Medicis’ reign and that his co-conspirators included Pope Sixtus IV, the Pope’s nephew Gerolamo Riario, Archbishop Salviati, and other members of the Pazzi family. Historians have known that the Pazzi family was implicated in the plot, but details were vague and the Duke of Urbino had escaped detection with his reputation as a noted humanist left intact. The plot hinged on an attempt to assassinate two brothers in the Medici family: Lorenzo and Giuliano de’ Medici. Afterward, the duke planned to seize the city with 600 well-trained soldiers. In the newly surfaced letter, the duke insists on proceeding quickly with the assassination. He also expresses his thanks to the Pope for a gold chain that the Pope gave to his son. The letter suggests a new interpretation of another painting of the time, a portrait of Duke Federico, painted by Piero della Francesca, preserved at the Uffizi Gallery in Florence. The painting is a one-sided profile to hide his loss of an eye due from a jousting injury. During a high mass, on Easter Sunday in April 1478, Giuliano de’ Medici was stabbed 19 times and killed. Lorenzo de’ Medici was wounded, but a friend of his stepped in front of the attackers as Lorenzo fled to safety. The attack started a riot in which the city’s residents brutally killed plotters inside the city and hung the Archbishop. Allies of the Pazzi family then declared open war on Florence. Within a few years, Lorenzo?later nicknamed the Magnificent?triumphed and went on to rule over the golden age of Florence. Lorenzo’s survival was fortunate, according to Simonetta, because it was Lorenzo the Magnificent who eventually discovered Michelangelo’s artistic talent. Simonetta uncovered the letter during research for his doctoral dissertation. In July of 2001, he was granted access to the Ubaldini archive at Urbino, located north of Rome. While on a fishing expedition for his studies, he came across the curious, coded document written in Italian in 1478. “I knew I was looking at something important here because the letter was dated about two months before the attack on Lorenzo and Giuliano in the cathedral,” he says. Eventually, the foreign press caught on to Simonetta’s discovery, and articles appeared in leading publications in Italy, Spain, Russia, and Britain. The Renaissance murder mystery is also catching on in the U.S. media with stories in the New York Times, Hartford Courant and Discovery News. Simonetta moved to the United States in 1995 and earned his Ph.D. in Italian from Yale in 2001. He recently turned his dissertation into a book called Secret Renaissance: The World of the Secretary from Petrarch to Machiavelli. He plans on writing another book about the secret letter and the Pazzi conspiracy directed to an English-speaking audience.